When you walk in, the first thing that goes through your mind is “how did I leave Montreal?” This place has a distinctive European look and feel to it. Immediately, you will find a hostess come to greet you. Actually, you can’t really move too far in anyway since the entrance space is limited. The place is quite full and the crowd is in the 30 plus year old section. Reservations are recommended although not 100% necessary but they do help. The place is broken down into 2 sections: the left that is quite open and well lit and a large room to the right, which is more closed off. We started off with a yogourt Mueslix ($8.75) which was a vanilla yogourt with chunks of fresh fruit both big and small. The size was quite decent and the fruit was fresh. It worked nicely as an appetizer of sorts before the main meal arrived. I like plates like this because it can be shared and it is healthy and tasty. Although, I do find that at almost nine dollars, it is a touch pricey. Next came the Ham crepe ($9.25) which came filled with ham. This mix of cheese and eggs worked together into this odd consistency that covered the crepe. 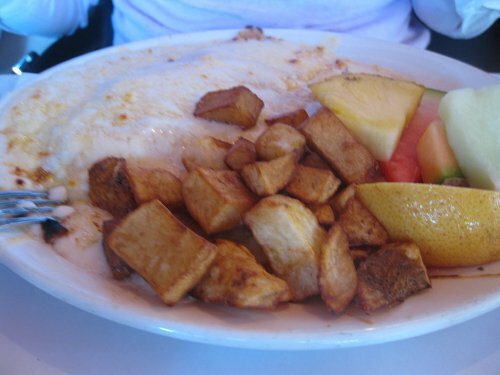 The dish also came with a side of potatoes and fruit: the fruit was good and the potatoes were average. What makes this dish most interesting is the cheesy topping. Words can’t properly describe what it looks like. You are best served by looking at the picture on this page. Initially, my friend was surprised on how a crepe was not a normal crepe – the crepe was hidden under a mountain of dairy and although it tasted good it was not what she was expecting. The crepe itself was salty and not your run of the mill crepe you would get anywhere else. We also ordered the “Egg” Benedict (9.00) and I use the singular tense since it was only one egg, The plate came with a side of potatoes and fruit. 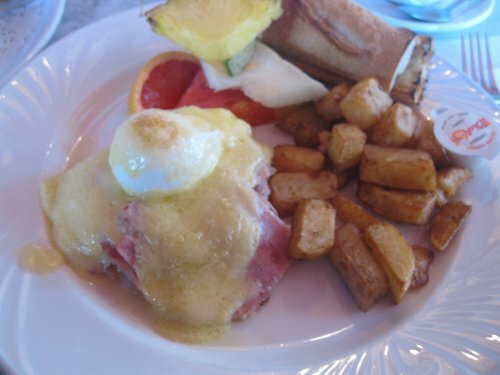 The eggs benedict itself was tasty but also a little salty – but in all fairness, this dish is intended to be a salty dish as opposed to a sweet dish. The cooking style focuses more on salty than sweet and if you like that European flavour and look to your food than this is the place for you. However, at $9.00 for a single egg benedict, it is a touch steep compared to other places that would give you two eggs for a dollar or two more, and include free coffee. The service was mediocre and our waiter disappeared at some point meaning that coffee refills were quite rare. The hostess was very nice and polite and seated us quickly but our waiter was not using his A game. 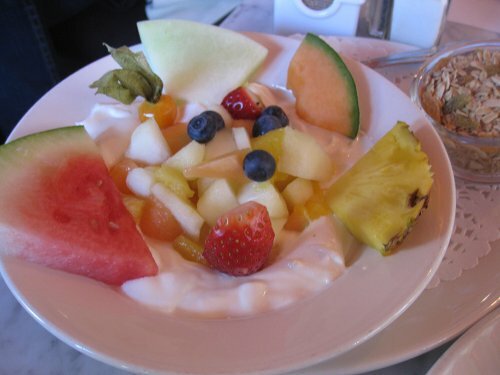 There are some vegetarian options and healthy options like the yogourt along with an omelette section as well. If you order and want to make sure it is a vegetarian plate ask whomever is serving you since the menu does not give a breakdown of what is in each plate. 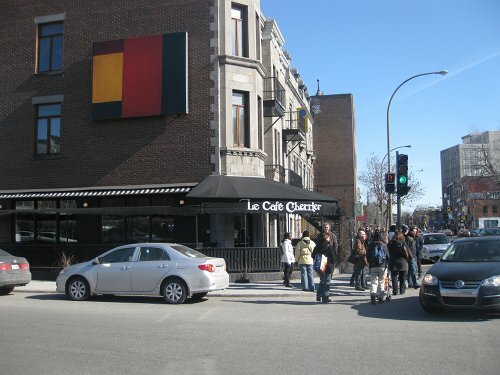 I felt café Cherrier was pricey, they food was good and I was satisfied in that aspect. I felt that some dishes were unnecessarily expensive and when you factor in that coffee is not included it comes out to a good bit more. I would suggest this place if you are fan of salty dishes and like a classic décor. I mean this places dates back to 1931 so you will get that old world décor and a pretty amazing terrace.